Traders on Bury Market indulged their sense of fun on Saturday 22 October when they came to Market in their silliest hat. This could be one of their own creation or something they simply found in their 'dressing up cupboard' at home. 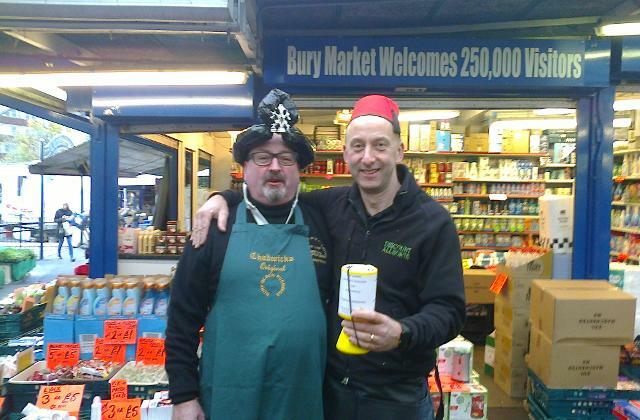 The aim of the day was to bring a smile to the customers and raise funds for Bury Hospice via donations into the collection boxes situated around the Market. Bury's Traders have been taking part in Bury Hospice's Corporate Challenge in which teams were given five months to turn £50 into as much money as possible. The project ends on 31 October and so the final total has yet to be confirmed but already in excess of £600 has been raised by the Market Traders' efforts.